It was time to put a new, (used in excellent condition), radiator in Abbie. Part of the change was to ditch the old mechanical fan, (it just was not working properly any more), and go with an electric fan. I've been driving around without power to the fan for a couple of weeks. The weather is mild and the fan is just not needed. But I would not want to take it off road and climb something steep without it. This fan was meant to mount on the front of the radiator so I reversed the blades, they are cut to be more efficient when properly oriented. I also had to put the old mounting rails from the old radiator on this one to keep the clearance. This one must have been from something in the eighties, I just don't know. I didn't just want the fan to switch on and off, I want it to run variable speed. 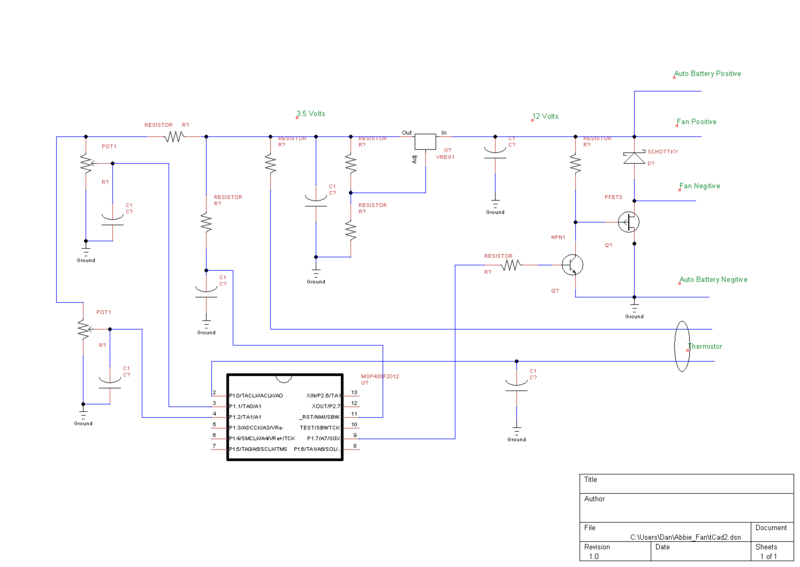 Creating some kind of analog front end that ends with a PWM output is old school. An MSP430 is a cheap and quick solution for the challenge. First time out, I've hacked a simple algorithm that checks the values of two pots and a thermistor at each chop output for the motor. It is not an efficient algorithm, but it doesn't have to be for this application. pot_A will set the temperature that the fan will start to run. pot_B will set the delta T response that increases the speed of the fan. So the fan will start running at some 182 degrees and get to full speed at about 188. At least, that is what I see from here. But that is why the pots, I can trim this to anything I'd like in the field without digital communication to the msp430. The positive battery is actually hooked to the ignition relay. No sense in running the fan if the water pump is stopped. A seal made with JB Quick and I have just what I want. Here it is mounted and operational. It works like a champ. The speed of the fan gently ramps up and down never needing to get to full speed with the engine idling on a 70 degree day. This was a fun project. I'm pleased with the results. Electric, and a proportional PWM driver are the only way to go. Copyright © 1996 - 2011, Highlands Electronics All Rights Reserved.